In the Luce study center. Photo by Eric Michael Tollefson. 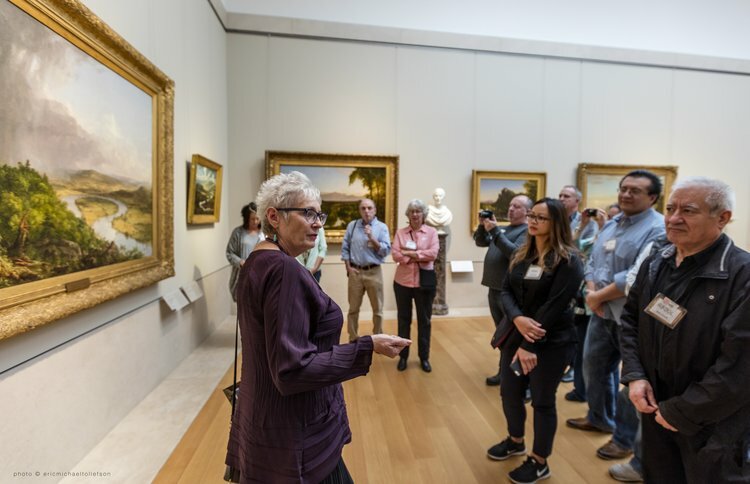 On Sunday, September 25, 2016 I was pleased to offer a frame-centric guided gallery talk about frames in the American Wing of the Metropolitan Museum of Art. The group who had requested the tour was the Metro-Atlantic Chapter of the Professional Picture Framers Association (PPFA). The PPFA is a national organization of framers and frame shop owners; I had been delighted to have offered a keynote address at two of their annual conferences and to have also taught classes on several topics including the life and frame designs of noted architect Stanford White. 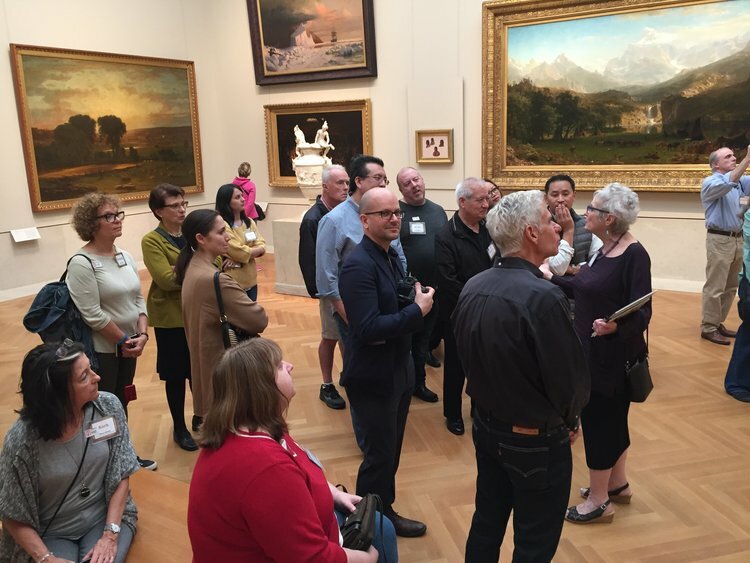 The enthusiasm of PPFA members for American frame history makes them a wonderful audience, and the Sunday gallery talk was no exception. We started the tour in the Henry R. Luce Center for the Study of American Art. (Galleries 773 & 774.) Many people do not realize that the study center visible storage contains an entire case of significant, untenanted American frames of the 19th and early 20th centuries. We started there and discussed things such as fabrication techniques and stylistic evolution of frame design between 1800-1930. Next, we moved up to the paintings galleries and touched on a variety of different artworks: Thomas Cole’s View from Mount Holyoke, Northampton, Massachusetts, after a Thunderstorm—The Oxbow (1836), Eastman Johnson’s The Hatch Family (1870-71), artworks by Dwight Tryon and Thomas Wilmer Dewing in Stanford White frames and Madame X (Madame Pierre Gautreau) by John Singer Sargent (1883-4). Discussing the frame on Thomas Cole’s View from Mount Holyoke, Northampton, Massachusetts, after a Thunderstorm- The Oxbow, 1836. 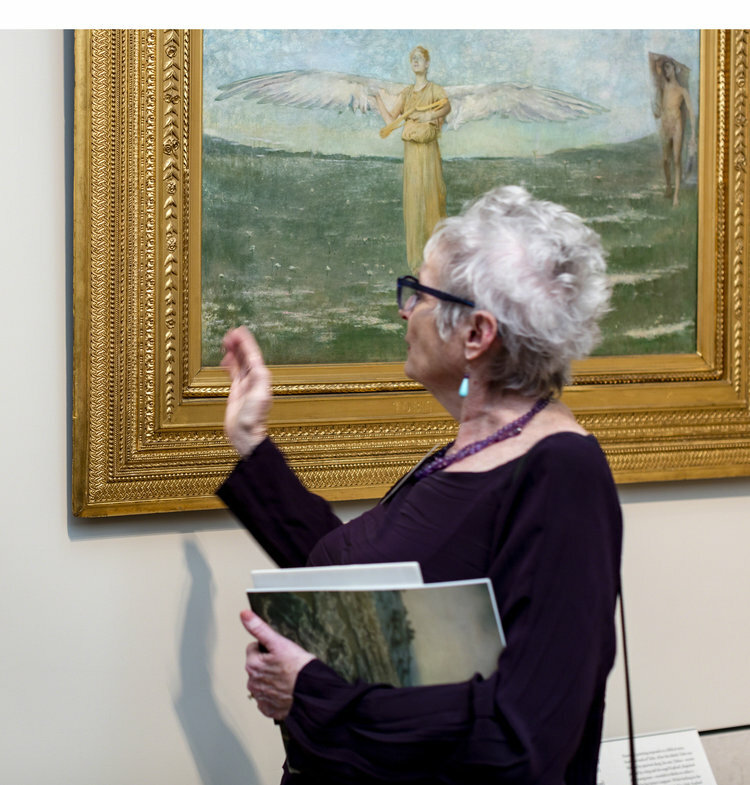 Original Stanford White frame on Thomas Wilmer Dewing’s Tobit and the Angel, 1899. 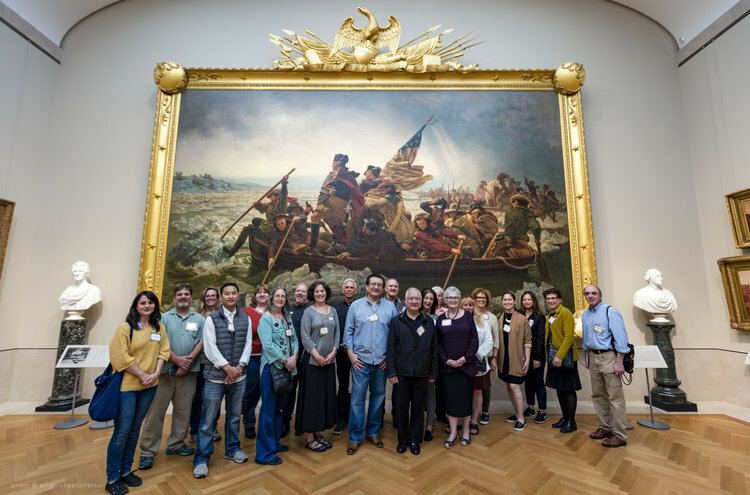 Our tour concluded in the Grand Salon (Gallery 760), which contains masterpieces such as Albert Bierstadt’s The Rocky Mountains, Lander's Peak (1863), Frederic Church’s Heart of the Andes (1859) and of course, Washington Crossing the Delaware by Emanuel Leutze (1851). The Leutze painting holds special interest for framers as the original frame, known only through two extant period photos. 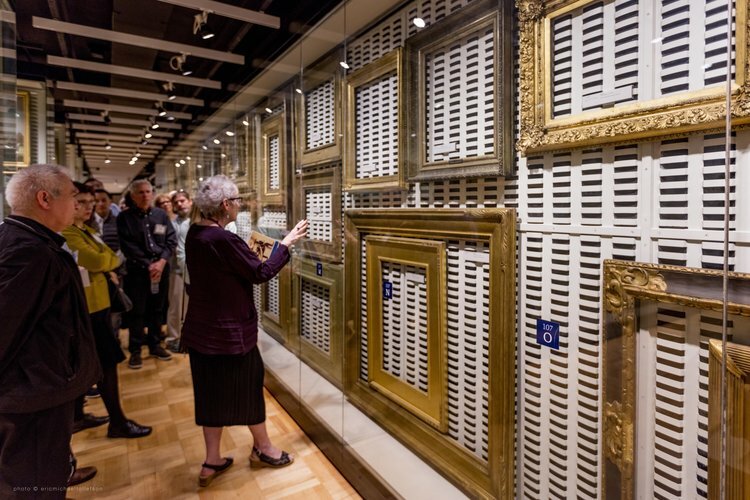 The frame was recreated for the painting by Eli Wilner & Company and went on view in 2012 following the expansion and reinstallation of the American Paintings galleries. There is an excellent bulletin from the MMA detailing all aspects of the project. The unique design, complex crest and monumental scale of the frame all make the grandly framed painting a dramatic and compelling sight. In the Grand Salon gallery, in the background Albert Bierstadt’s The Rocky Mountains, Lander’s Peak, 1863. The group in front of Leutze’s Washington Crossing the Delaware, 1851. It was an enjoyable day where much was shared and we all took delight in celebrating the artistry inherent in picture framing. Posted on October 7, 2016 by Suzanne Smeaton and tagged American Art Thomas Cole Eastman Johnson Thomas Wilmer Dewing John Singer Sargent PPFA Frame history Luce Study Center Museum Private gallery tour Stanford White Frames Albert Bierstadt Frederic Church Washington Crossing the Delaware. "Can you help me contemporize my home by reframing some of my collection?" What frame-related conversation would you like to hear? Please comment on my posts, and I'll aim to be responsive to your requests. "Since the early 1990s, my go-to specialist on issues of historic framing has been Suzanne Smeaton. Together we have surveyed American art collections at the Virginia Museum of Fine Arts and at the Baltimore Museum of Art. We have identified original period frames that subsequently received professional conservation. We have selected period moldings for important paintings, and have chosen frame designs for replication when an antique frame was unavailable. I have long lost count of the number of beautiful 18th, 19th, and 20th-century American paintings I have re-housed in collaboration with Suzanne." Website Design by JCP: PC & Mac, Inc.
© 2017. All rights reserved. Suzanne Smeaton, LLC.